One of the fascinating aspects of the American flag is the addition of stars to the flag to represent the growth of the nation in such a unique and emblematic way. I know of no other flag, of any nation, that has been so dynamic in its evolution. One would think that attributing a date to a flag would be a simple matter, based on the number of stars present on the flag and the history of statehood. But that's a misconception. For example, 13 star flags have been used throughout our history, even into the 20th century, most commonly for naval or maritime use. During the Civil War, exclusionary flags and southern sympathy flags contained various star counts representative of the composition of the north or south. As different states celebrated their centennials, sesquicentennials, bicentennials, and other milestone celebrations, later period homemade flags in their statehood count were produced and preserved, resulting in antique flags that seem to be older than they actually are. Extremely Rare - Period flags with star counts in this category most likely number less than a dozen specimens, and some may not be known at all. A one in 25,000 or greater flag. Rare - Period flags are difficult for collectors to find and are encountered very infrequently in collections or in the marketplace. A few may come to sale once every 6 months to a year. A one in 10,000 flag. Occasional - On any given day, one or two flags of this star count may be found for sale in the marketplace. A one in 250 flag. Common - On any given day, many flags of this star count may be found for sale in the marketplace. A one in 50 flag. Original examples of the Continental Colors are possibly unknown. I am aware of a single example attributed as a period example, and just five or six examples of sewn construction that date to the period of the American Centennial in 1876. The example shown here is one of pieced and sewn construction from the period of the American Centennial. While these later antique examples are themselves extremely rare, an authenticated and documented original example from the 1775-1777 period may not exist. *Original 13 star flags are virtually non-existent. Not even the Smithsonian has an original period 13 star flag from the time when we had 13 states. 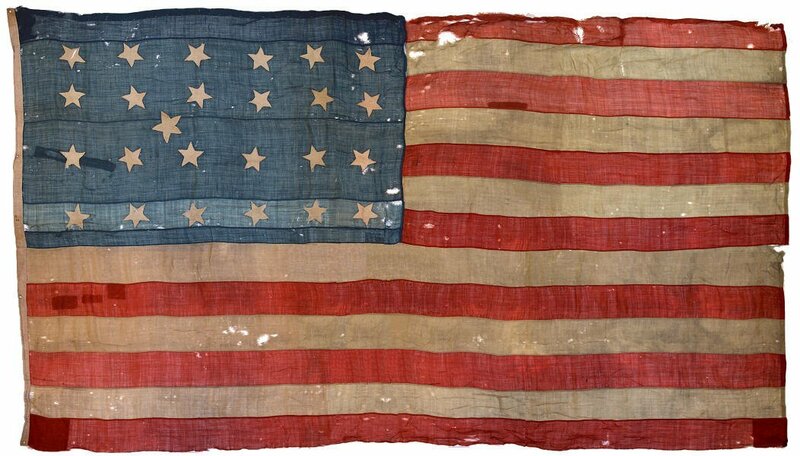 However, 13 star flags were made throughout our history, thus they are one of the more common of the star counts you may encounter on antique American flags. Typically, they are either small printed parade flags of 13 stars that date to the Civil War or Centennial period, or they are maritime ensigns that were used predominantly in the period of the Civil War through the first quarter of the 20th century. Examination of construction techniques and materials are necessary to provide a reasonable date for 13 star flags. Those that predate the Civil War are especially rare. The flag pictured here, IAS-00225, has characteristics consistent with an original period 13 star flag from the 18th century. Very few period 14 star flags are known to exist, probably ten or fewer. Later period 14 star flags believed to be from Vermont's centennial in 1891 are also very rare. The most famous of the 15 star flags that still exists is the Star Spangled Banner. In total, there are most likely ten or fewer period 15 star flags known to exist. 16 star flags from the time of Tennessee statehood are extremely rare. Some later period 16 star flags were produced as naval ensigns, so the star count, while rare, is somewhat more frequently encountered than other counts with fewer than 20 stars. 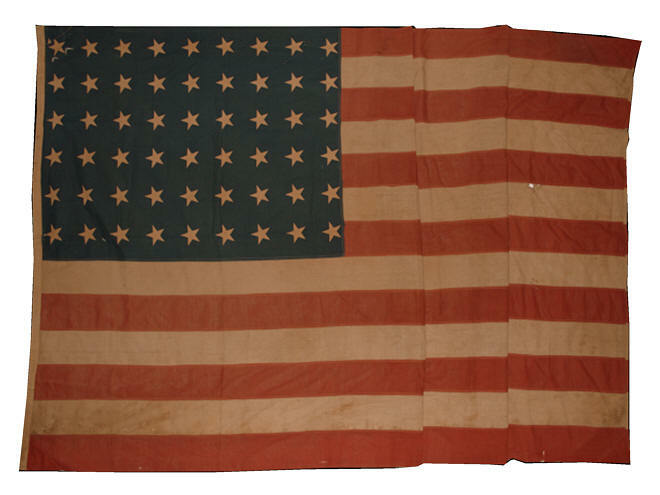 The 16 star flag shown here is a Civil War era small boat ensign, likely used by the Navy. There are likely less than ten antique 19th century 16 star flags known. Period flags and later celebratory flags in this star count are extremely rare. Period flags and later celebratory flags in this star count are extremely rare. The flag pictured was originally 19 stars, later updated to 25. You can read more about this rare flag here. 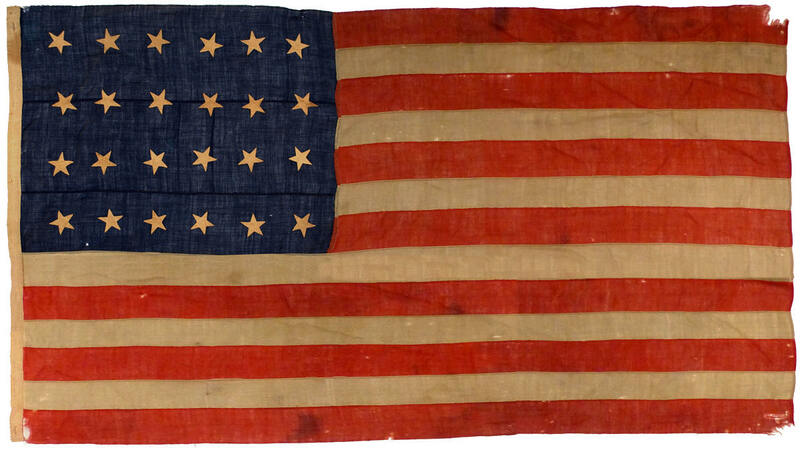 20 Stars, 13 Stripes Becomes Official with Third Flag Act on April 4, 1818. Since 20 became official with the introduction of the new third flag act, people produced some period 20 star flags as an update, though there are few surviving period examples. Also, 20 star flags were used as maritime ensigns later in the 19th century, up to and including the time of the Civil War. These later period 20 star flags do surface occasionally. Period flags in this star count are extremely rare. Some later period exclusionary flags from the Civil War period appear in this star count, but they too are extremely rare. Period flags in this star count are extremely rare. Although the period for 24 stars lasted for a relatively long time, flags in this star count are extremely rare, since militarily the nation was at peace and flag making for home use was uncommon. Some flags were made during this period to welcome Lafayette on his visit to the United States in 1824, but of the few flags that are believed to be from this period, possibly to celebrate that event, most feature 13 stars. Period flags in this star count are rare but less so than other star counts of the era because the number of states remained at 26 for more than 8 year and a new type of flag, the printed parade flag, emerged during this time. Period flags in this star count are extremely rare. Most likely, there are ten or fewer period flags in this star count known to exist. Period flags in this star count are rare. Printed parade flags in a medallion configuration exist in this star count, but they are very rare. Pieced and sewn flags are also rare. Period flags in this star count are rare. With the wide spread mass production of sewing machines in the 1850s, machine stitched flags begin to emerge. The earliest sewing machines produce a "chain stitch". 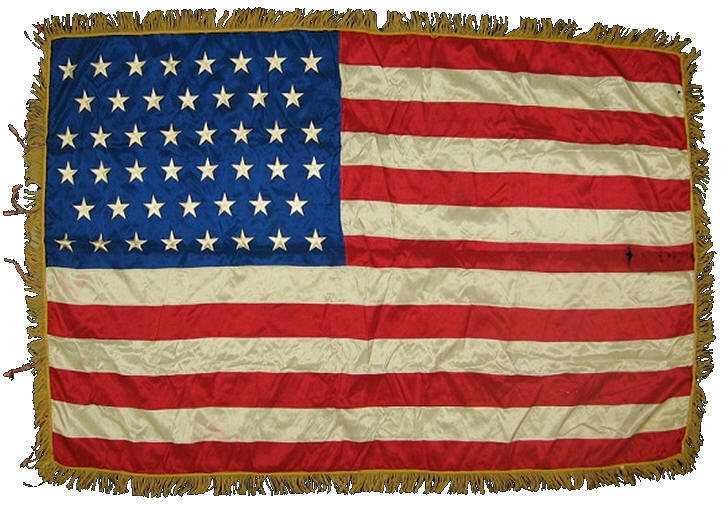 The 31 star flag shown here has both stars and stripes sewn with a very early sewing machine chain stitch. Hand stitching remains the more common way of affixing stars to flags until the 1890s due to the higher degree of skill required to do the task efficiently and well using a sewing machine. Period flags in this star count are rare. Large flags with clamp-dyed stars appear in this star count, with a somewhat common trait of being updated with the addition of two sewn stars to 34. I speculate that this was because many people purchased new flags after nearly 8 years of 31 stars being accurate, only to have Oregon and Kansas added in the course of less than three years. Furthermore, the patriotic sentiments of the Civil War era are beginning to emerge by this time. Period flags in this star count are rare. 33 star printed parade flags, many in various medallions or scattered patterns are overprinted with campaign candidates for the 1860 presidential election. 33 star pieced-and-sewn examples are very rare. Period flags are scarce. They were produced in large quantities at the outset of the Civil War both for military and personal use, but few survive. Although some Civil War units that muster into service early in the war bring earlier flags of 33 stars or fewer, may are provided with newly sewn presentation colors of 34 stars made by the women of their home communities. 34 star flags remain with the units throughout the war, though later in the war those that are badly damaged or lost may be replaced with flags of 35 or even 36 stars. Period flags are scarce. The secession of West Virginia from Virginia, which resulted in the introduction of another state in the Union, carved from one of the southern states, lead to great tension between various sympathizers of either cause, especially along the Virginia-West Virginia and West-Virginia-Ohio borders. 35 star flags are the only count that falls squarely into the active period of the war. Although the flags are scarce today, they were made in sizeable numbers in the patriotic fervor of the war. Period flags are scarce. the actual period of the 36 star flag spans almost six months of the war, though the official period follows the end of open hostilities. Although generally a reconstruction era flag count, because of the date of Nevada's introduction, flags are considered Civil War Era flags and it is known that 36 star flags were used by military units during the course of the war. Period flags are scarce. Despite the fact that the period for 37 stars lasted for more than nine years, the star count is relatively scarce compared to other post-Civil War star counts. This is because of the general lull in patriotic sentiment, when compared to the Civil War which precedes the count, and the Centennial era that follows. Most flag manufacturers, ahead of the Centennial in July, 1876, were anticipating the introduction of Colorado, and therefore produced 38 star flags rather than 37 star flags ahead of the celebration. Period flags are occasionally encountered, but are generally uncommon. Because of the large number of flags made for the Centennial celebration and the long period for which 38 stars were official, 38 star flags are not as scarce as the Civil War and Reconstruction era counts of 33 through 37. Printed 38 star parade flags in the medallion pattern, in many cases with two outlier stars, are a common format. By this period, though, certain patterns such as the Grand Luminary pattern, fell out of common use. Period printed parade flags are occasionally encountered, but generally are uncommon. Flags of pieced and sewn construction in this count are extremely rare with likely less than ten known examples. 39 stars is an unofficial count, because of the introduction of North Dakota (39) and South Dakota (40) at one time, instead of as a single state (formerly the Dakota territory). Despite the fact that we went from 38 stars to 40 stars in a single event, 39 star flags are actually more common than 40 star flags, which are extremely rare. Since people anticipated a single state, rather than two, manufacturers produced reasonably large numbers of new flags of the 39 star count, only to find that they would never be official. Period flags are extremely rare. Most people anticipated the 39th state to be the Dakotas, not two states of North Dakota and South Dakota. Therefore, 39 star flags are relatively easy to locate. The jump to 40 stars required people to rapidly adjust to the two Dakotas, but before many people could produce 40 star flags in response, Montana's introduction just 6 days later made 40 star flags obsolete almost immediately. Therefore, very few 40 star flags exist today because very few were produced. Period flags are extremely rare. In even less time than the 6 days between 40 and 41, 41 became obsolete, being advanced by Washington State to 42 stars after just 3 days. Like the 40 star flag, 41 is extremely rare In fact, it is more rare than even 40, because although some people may have anticipated a two-Dakota induction, the rapid fire succession of South Dakota to Montana to Washington State, in less than ten days, barely gave time for any flag making to occur. Period flags are occasionally encountered, but generally are uncommon. Although the count is unofficial, the count remained the actual count for more than 8 months. 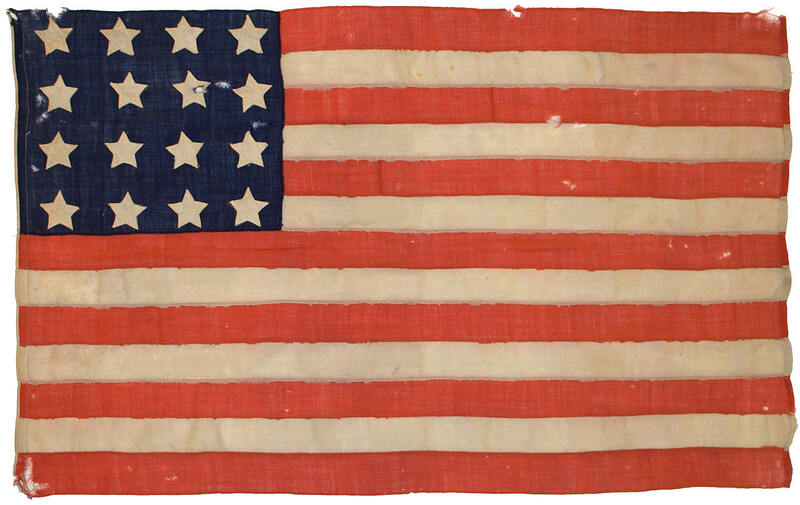 During this time of relative settling, compared to the ten day jump from 38 to 41, both printed and sewn flags were produced in the 42 star count. Also, many people expected Washington to become official on July 4, 1890, but that was not to be, with Idaho's introduction just one day prior to Independence day. Period flags are extremely rare. Just one day prior to 42 becoming official, Idaho was introduced as the 43rd state one day before July 4, 1890, and therefore became official the following day. Unlike previous star counts where unofficial counts were rare and unusual, this official count is extremely rare, because of Wyoming's introduction as the 44th state just six days after Idaho became official. Not wanting to produce obsolete flags, most flag manufacturers and homemade flag makers simply skipped 43 stars to produce 44 star flags. Period flags are occasionally encountered, but generally are uncommon. Although 44 stars span a period of 5 years, the period was post Centennial and pre-Spanish American War. Although flags were made for events such as the Columbian Exposition in 1892, generally 44 star flags are less common than their later counterpart of 45 stars. Period flags are common. Official for 12 years, and spanning the Spanish American War which incited great patriotism, 45 star flags are relatively common and can be acquired readily. Flags in the count with unusual characteristics such as unique star arrangements, overprints or constructed entirely by hand are less common and more desirable. Period flags are common. 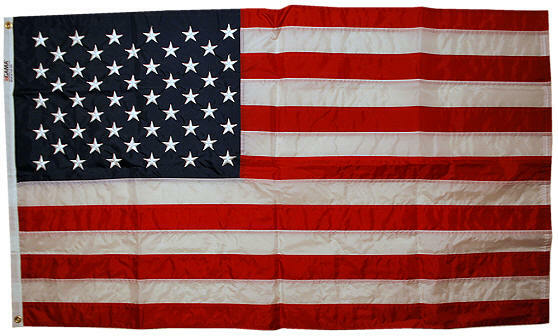 Official for 4 years, flags of 46 stars were produced in large quantities by manufacturers of the early 20th century. They are readily available to collectors. Period flags are extremely rare. Most Americans barely had time to react and produce stars for New Mexico before Arizona followed to make the 48th state. As a result, very few 47 star flags exist today. They are a rare unofficial star count and are sought after by collectors as a star count that is very difficult to obtain. Period flags are common. This is the star count widely known to most Americans when they think of an "antique" flag. Because this is the flag that most grandparents and great grandparents would have from their youth, it is commonly found in estate sales and among the possessions of veterans of World War I, World War II and the Korean War. President Taft's executive order of June 24, 1912, which standardized the canton of the stars on the flag to 6 even rows of 8 stars makes unusual star configurations relatively uncommon and often indicative of an early flag, circa 1920 or before. Period flags are common. Although only official for one year, large quantities of 49 star flags were produced to welcome Alaska into the Union, and many survive today. Period flags are common. Our current canton of 50 stars has been official for more than 50 years, and millions of flags in the 50 star pattern have been produced and are flown today. The flag pictured has personal meaning to me. I received it for work performed in Afghanistan in 2003. The accompanying certificate, presented to me along with the flag, reads: "So that all shall know, This flag was flown in the face of the enemy, and bears witness to the capture, interrogation, and detainment of terrorist forces threatening the freedom of the United States of America and the World. It was present for 9 hours and 11 minutes on the 21st day of November 2003 during Operation Enduring Freedom at Bagram Air Base, Afghanistan In Honor Of Anthony Iasso"
Future star counts on antique flags are an unusual area of flag collecting, and are generally rare. Flags with greater than 50 stars might have been produced by mistake or in expectation of the addition new states from territories such as Puerto Rico and the Philippines which did not occur. The flag pictured here with 54 stars is an early 20th century flag, most likely circa 1912 when 48 stars were introduced. It is not known whether the maker simply made a mistake and added an extra row of 6 stars to the 48 pattern, or was of the expansionist movement then prevalent in the early 20th century and expected other states or territories to be added to the Union along with Arizona.